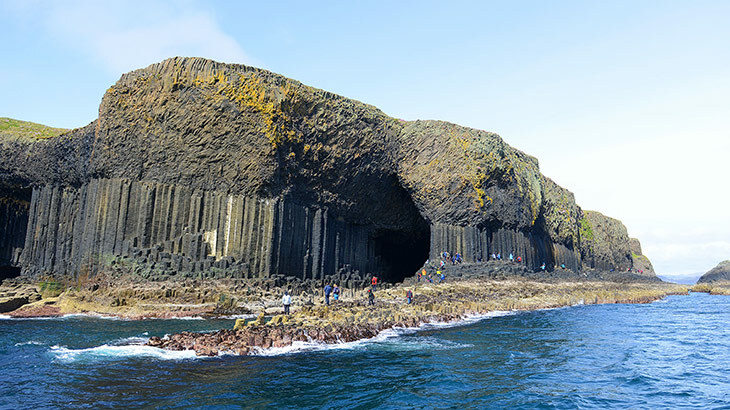 Three features combine to make Fingal's Cave on Staffa perhaps the best known of all caves. Its struture is unique. Nowhere else is there a sea cave formed completely in hexagonally jointed basalt. Its appeal lies in the size, the sounds, the colours, and the remarkable symmetry of this 227 foot cavern, and by Nature's gift of fractured columns which form a crude walkway just above high water level, allowing exploring visitors to go far inside. Secondly, the evergreen popularity of Mendelssohn's "Hebrides Overture (Fingal's Cave)" provides a continuous stirring reminder of this wonder of the world. ..one of the most extraordinary places I ever beheld. It exceeded, in my mind, every description I had heard of it ...composed entirely of basaltic pillars as high as the roof of a cathedral, and running deep into the rock, eternally swept by a deep and swelling sea, and paved, as it were, with ruddy marble, baffles all description. The question "how was Fingal's Cave formed?" is often posed. Eminent visitors have seriously asserted that it must, because of its regularity and because it points exactly at Iona, have been hollowed out of the island by hand. In fact, the answer is straightforward. Since the layer of rock made up of columns would all have been laid down at one time it follows that when the tilting occurred there would have been pressure above the present site of the cave, and a fissure would have been forced open directly below, where sea now surges in. The violent action of huge waves that would have struck the island during storms over thousands of years developed the fissure, undermining dozens of columns, to create the opening we marvel at today. The origin of the name 'Fingal's Cave' is wrapped in myth. Around 250 AD Finn MacCumhaill, or Fingal, was possibly an Irish general who had a band of faithful warriors - a Celtic parallel to King Arthur and his Round Table. Fingal is supposed to have been the father of Ossian, traditional bard of the Gaels. Gaels migrated into Scotland from Ireland until the Norsemen began their raids on the Scottish coast, and the stories of Fingal would doubtless have come across too. Soon he became revered in Scotland and, boosted by the Ossianic heroic verse and songs, his name was a natural choice to assign to this dramatic and awe inspiring cavern. We were put out into boats and lifted by the hissing sea up the the pillar stumps to the celebrated Fingal's Cave. A greener roar of waves surely never rushed into a stranger cavern - its many pillars making it look like the inside of an immense organ, black and resounding, and absolutely without purpose, and quite alone, the wide grey sea within and without. Conditions were so bad that the little craft had only reached Tobermory by nightfall, and Mendelssohn can hardly have enjoyed seeing Fingal's Cave since he was so seasick. However, the visit to Staffa, and the sight and sound of the Atlantic swell tumbling into the Cave, made a profound impression on him. The theme in the illustration, which he later developed into the ever-popular Hebrides Overture, occurred to him immediately. He was just 20 years old. We have a number of daily tours to the Isle of Staffa and Fingal's Cave, most visit either the Treshnish Isles or Iona as well, and are a full day out. On route you will see spectacular coastal views, breathtaking mountain scenery and the rich wildlife that the Scottish Islands has to offer. See below for tours departing from Oban, Iona and the Isle of Mull.